TIN EARS: Cablevision’s James Dolan performs at the Times Square Hard Rock Cafe yesterday at a benefit to fight pancreatic cancer, as union members protest outside. Members of Communication Workers of America Local 1109 protested outside a cancer survivor tribute and fundraiser this past weekend. Last night, members of the Communications Workers of America Union distributed flyers calling Cablevision CEO James Dolan an “Ebenezer Scrooge” outside the annual holiday fundraiser for the Lustgarten Foundation, a pancreatic cancer charity supported by the company. Cablevision released a statement about the situation this afternoon calling the union’s activities at the event “shameful” and accusing CWA of numerous other misdeeds. 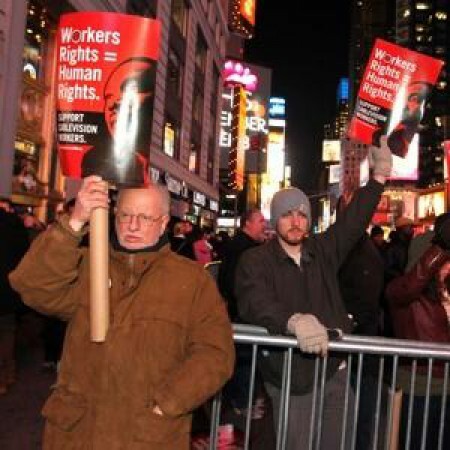 CWA and Cablevision have been locked into an ongoing dispute for the past year as the union attempts to organize workers at the television company. Cablevision accused the union of exploiting the hurricane because it has loudly criticized the company for not automatically refunding customers who lost television service during the storm. Local 1109 defended its despicable actions today following the NY Post’s article on their rally.